This week I was very excited as I got a birthday present 2 weeks early. 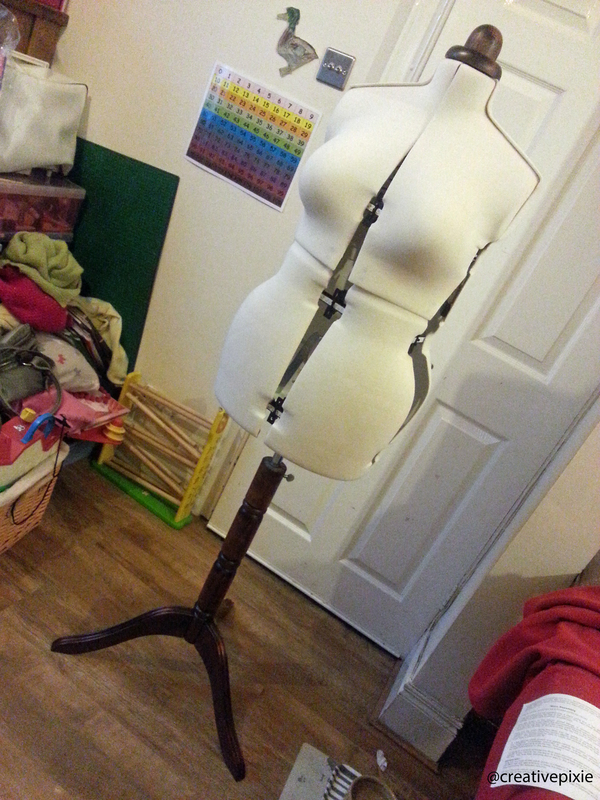 My husband and girls bought me an Adjustoform Lady Valet dress makers dummy. I’ve wanted one for ages, but they are quite expensive, so I was really excited when Hubby suggested one for my birthday. It has 12 dials to adjust the measurements of the dummy so that they fit your body measurements. My waist measurement seems to be a bit bigger than what it should be (I blame chocolate and crisps) however the dummy was able to go there. I thought my first project using this would be a dress alteration. I bought this dress last year for about £2 in the Sainsbury’s clothing sale. 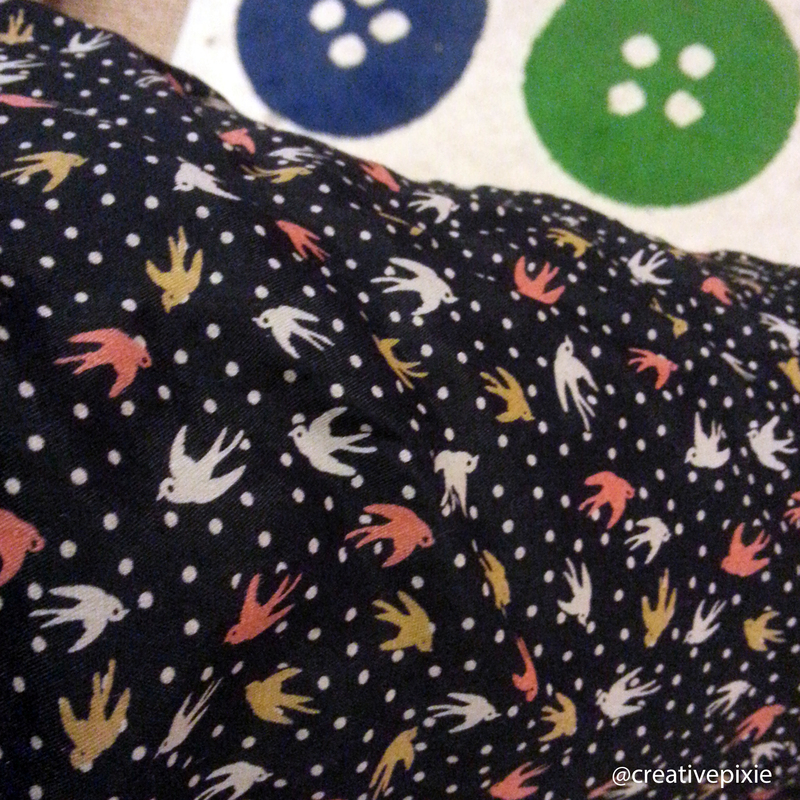 What I liked about it was the print – cute little birds, I’m a sucker for bird prints on clothing. 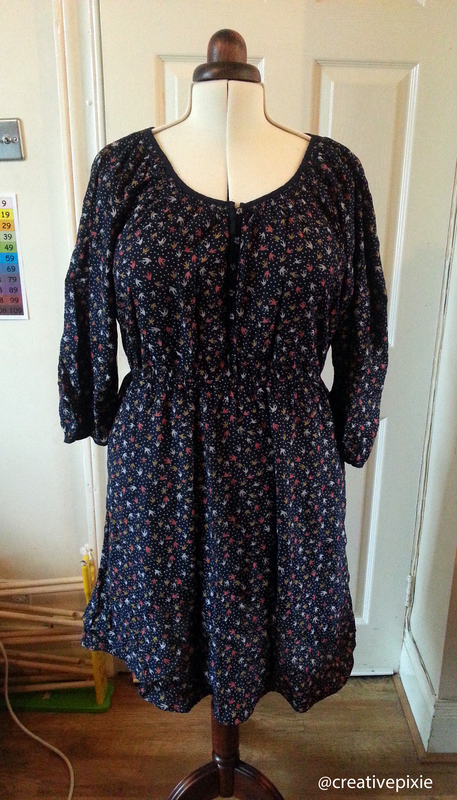 However when I tried the dress on there seemed to be something very wrong with the sizing – the top half of he dress was almost a couple of sizes too big so not wearable (unless I wanted to look like a big sack of potatoes). So the dress has been sitting in a cupboard waiting for me to alter it. So out came the sewing machine and I pulled the top of the dress up and sewed about 2 inches off each shoulder/top of the arms. 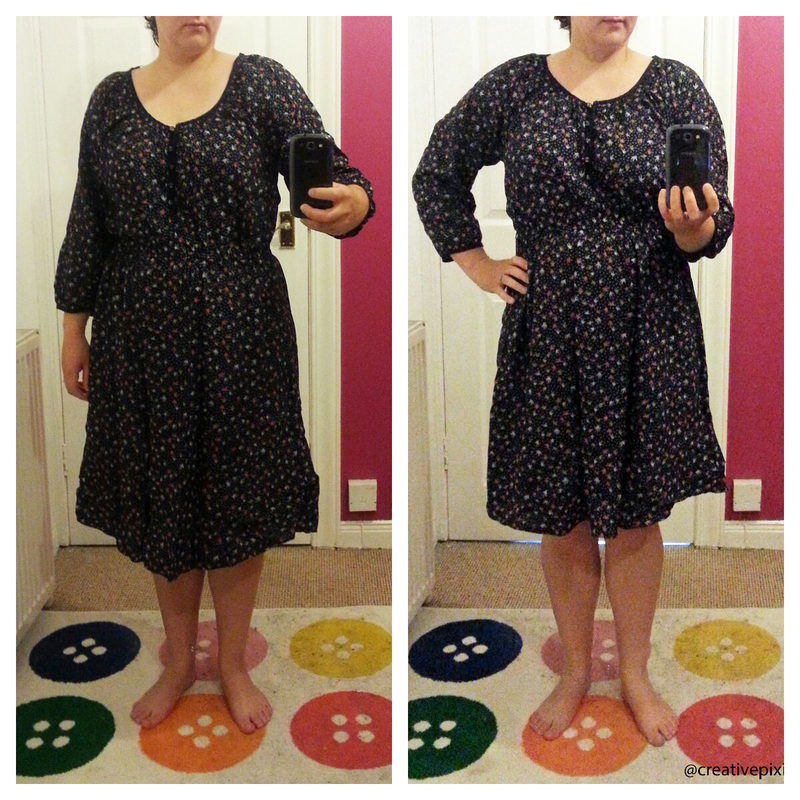 I also took up the hem of the dress – approximately 2 inches. My dress form was such a help with doing this, I’ve made clothes for myself in the past but it really is such as hassle taking on and off clothes with pins poking out everywhere. The dress fits a lot better now and I think I will wear it – hurrah! 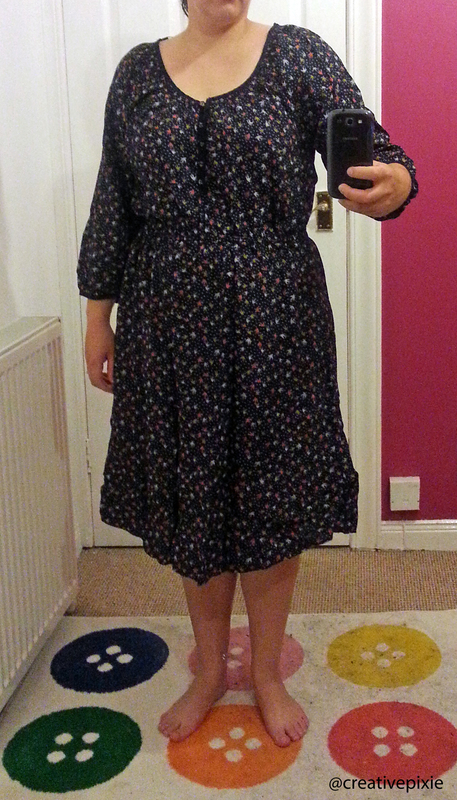 (apologies for the noisy photographs – my daughters bedroom has the best mirror but the worst lighting). Now I have my dress form I think this is going to be the start of some major clothes making for myself. I should also probably think of a name for the dress form, I like the idea of referring to her with a name. Suggestions please! That fabric really is awesome 🙂 Go you for turning the dress into one you’ll actually wear, gotta love how sensible crafters are about such things! Love the print 🙂 And the alterations are so subtle, but the ‘after’ picture looks so much more elegant – great job! Thanks 🙂 I have worn it out since I altered it and it felt good to wear. Mine is called Diana. She has a label on her chest saying so! Diana and I have have many a pleasant (and some not so pleasant) hour sewing. I hope you and your “Diana” whatever her name may be, have some lovely times together too. Thanks, I’m still undecided on her name. The rug is a beauty, it’s from IKEA. Good job! I have the same dress and I had the same problem…I altered it too.It was the only way to wear it! How did you finally call your helper?